A University of New Mexico alumna hopes to become one of only a select few female Navajo licensed architects in the world. Geraldene Blackgoat is now one step closer to that goal, after receiving the prestigious Jason Pettigrew Memorial ARE Scholarship. The Architectural Registration Exam (ARE) scholarship, developed by the AIA National Associates Committee, gifts recipients with funds to cover the cost of the licensure exams and study materials – estimated at more than $1,200. Blackgoat is one of only 10 award recipients nationwide, along with emerging professionals from Chicago, Detroit, Seattle and Washington D.C., among others. A member of the Navajo Nation, Blackgoat grew up in Sanders, AZ. before obtaining her bachelor’s degree in architecture at UNM in 2013 and her Master of Architecture here in 2016. She said growing up on the Indian reservation, she didn’t know of many Native American architects and even wondered if they existed. “When I was in high school and college, I would Google indigenous architecture and architects but there wasn’t much there,” she said. That curiosity spilled over into her studies, where she began to question the cultural appropriateness of government housing provided for Native Americans. Blackgoat’s project in graduate school mirrored the curiosity of her younger years, as she pursued research on tribal housing. She says a main reason for the deviation from tradition is that current homes were not designed by Navajo or Native American people – because very few of them pursued careers in architecture or design. That’s something she’s working to change by taking her success story back to the reservation. Part of her plan is to re-charter a New Mexico chapter of the American Indian Council of Architects and Engineers (AICAE) at UNM and, hopefully, other colleges and universities. The non-profit, established in 1976, is made up of American Indian architecture, engineering and design professionals throughout the United States of America, whose goal it is to spread their knowledge of such careers to indigenous classrooms. 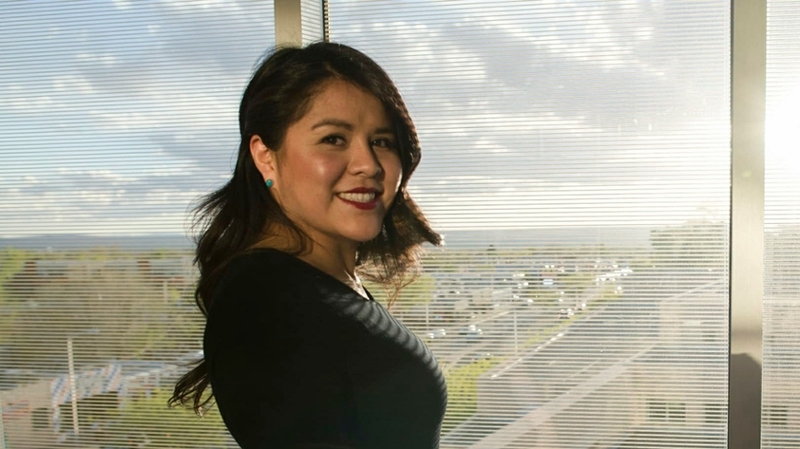 AICAE played an integral role in Blackgoat’s college career at UNM, allowing her to connect with other Native American professionals and students in the architecture, planning and landscape fields. She also encourages other alma maters from her high school to travel back to the reservation and encourage students to pursuing higher education. Already, there has been a handful who joined her in their hometown of Sanders, and she plans to make another trip there this year. She also worked with her mentor and role model Tamarah Begay to do similar tribal outreach. Begay, one of the first female Navajo licensed architects, who owns her own firm, is also an alumna of UNM SA&P and now works as an assistant professor in the School’s Indigenous Design + Planning Institute. In addition to encouraging Native American students to pursue higher education and holding a full time position at Greer Stafford/SJFC Architecture, Blackgoat is studying for the six Architectural Registration Exams she needs to pass in order to become licensed. Those tests are now the only thing standing in her joining the elite list of female Navajo licensed architects.